Preheat a pan. 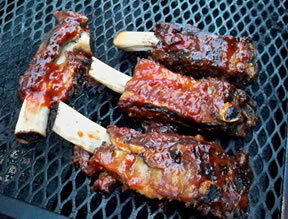 Season ribs with salt and pepper and brown. Place the onion, garlic, celery, carrot and tomato in a food processor and blend. Take a large Dutch oven and place over medium-high heat. Add some extra-virgin olive oil and add the thyme to infuse the oil. Add the vegetable mixture, season with salt and pepper as desired, and cook about 10 minutes. Pour in the red wine and beef stock and bring to a boil; the liquid should cover the meat. Reduce the heat to a simmer and cook about 2 1/2 to 3 hours. 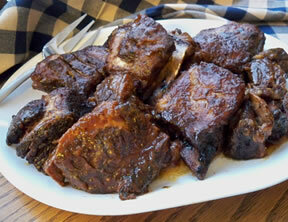 When the ribs are done, remove about 1 to 2 cups of the liquid, strain into to small saucepan over medium-high heat. Heat until reduced about 5 minutes.